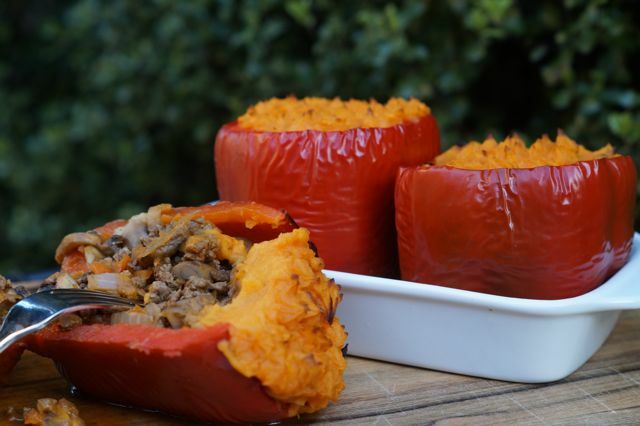 Paleo Shepherd’s Pie in a Capsicum Recipe. Yes, you could just serve mince, capsicum and mashed sweet potato on a plate but where’s the fun in that? This Paleo Shepherd’s Pie recipe is super easy, looks impressive and tastes amazing! Serve with a huge green salad or steamed greens! Mmm yummy paleo pie! This recipe is from our very first eBook Let’s Eat Paleo, which features over 50 other delish paleo recipes! ps. 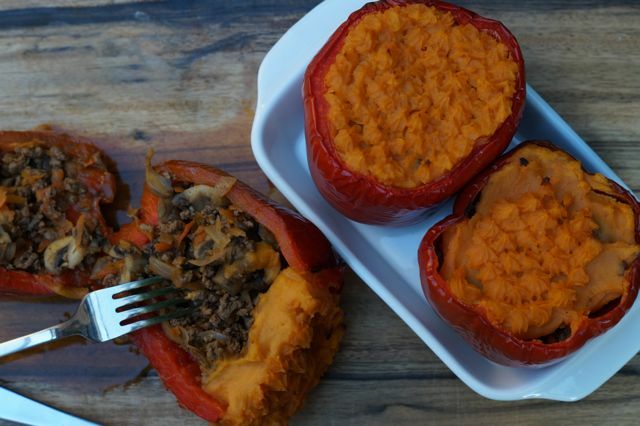 don’t forget to share you Paleo Shepherd’s Pie pictures with us on facebook and instagram! Use the hashtag #TheMerrymakerSisters so we don’t miss the pic! Melt the coconut oil in a fry pan on high heat. Add the onion and garlic, sauté until soft. Add the carrot, mushrooms, herbs, spices, tomato paste, salt and pepper. Stir well. Add the water and allow to simmer for 10 minutes. Meanwhile, in a food processor (we use our Vitamix) whiz the cooked sweet potato, almond milk + ghee to make a thick, smooth paste. Spoon the mince mix into the capsicums until ¾ full. Top with sweet potato mixture, we like to pipe the final layer of sweet potato to make it look pretty. These are great served cold. Lunch leftovers are on! Wooohoo!